The City of Ferndale works hard to protect the health, safety and welfare of our citizens. One way that we do that is responding to violations of the Ferndale Municipal Code. We have a dedicated individual that works on these issues to make sure that everyone can live in safe buildings and healthy communities. This page should answer some of your questions about Code Enforcement. If there is an emergency, please call 911. The Police Department will then contact City Hall about the incident. Potential Code Violations should be reported to a City Code Enforcement Officer. 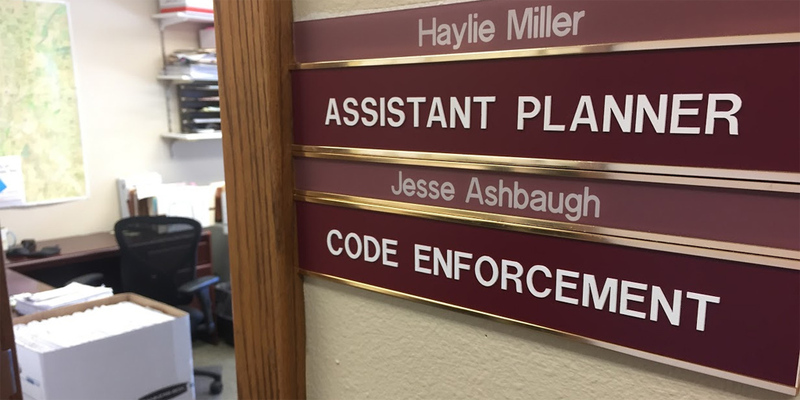 To contact Code Enforcement you can call 360-685-2358 or visit the Community Development Department on the second floor of City Hall. Fill out our online code enforcement form here. Visit City Hall in person and fill out a paper Citizen Action Request. Can you report a violation anonymously? Yes. In the event of a records request, your personal information will be redacted and only the content of the complaint will be released. The City will only investigate what it deems to be a credible complaint. Please call 911. The Police Department will then contact City Hall about the incident. Once a violation is reported, what happens next? To ensure fairness, we go through the same process with every complaint. Code Enforcement Officer investigates the potential code violation. If a violation is confirmed, Code Enforcement Officer initiates informal contact with property owner to inform them of a code violation, methods for resolving violation, and a date by which the violation must be resolved. A Notice of Violation may be issued without prior informal contact. If voluntary compliance is not reached, an official Notice of Violation is issued with a deadline for corrective action and an initial penalty of $1,000 is assessed. A Notice of Violation may be issued without prior informal contact. If compliance is not reached by the Notice of Violation’s deadline for corrective action, a fine of $1,000 for each violation may be issued, which will accrue on a daily basis. If compliance is still not met, the case is forwarded to the City Attorney for additional legal action. What if the violation could result in injury? The City can issue a Stop Work Order, requiring that all work cease immediately. The Stop Work Order may or may not include fines and may be temporary, such as when there are risks resulting from weather conditions. A violation of a Stop Work Order may result in criminal penalties. How quickly are violations resolved? Resolving a code enforcement case depends on how complex the situation is, and the level of cooperation from property owners and tenants. I want to know who complained about my property, can I find out? No, unless the complaint was issued by the City of Ferndale. The complainant’s personal information is considered private and exempt from disclosure through the Freedom of Information Act. Also, the source of complaints varies with each case. Sometimes they come in the form of Citizen Action Requests from the public. Other times the complaint will be fielded anonymously over the phone or through a voicemail. The Code Enforcement Officer might receive complaints from other staff members, or will see the violation while out in the field. However, the City will avoid unnecessary enforcement actions and will not investigate any claims it believes are not credible. To avoid having the City get involved in a civil dispute, staff may advise that the complainant to hire a land use attorney or investigate private dispute resolution. Why am I, as the property owner, being held responsible for violations caused by my tenants? Property owners are ultimately responsible for what occurs on their property. The City recognizes that the property owners may not have committed a violation themselves, but property owners are responsible for what occurs on their property. Even if property owners have a lease with their tenant, property owners will be responsible for any violation fines which resulted from activity on their property. Here are the details in the Ferndale Municipal Code. Why is the set fine for a code violation $1,000.00? Previously, the penalty for a code violation was $300.00. This resulted in many unresolved cases due to perceived low value of the violation. The penalty for a code violation was increased to $1,000 to promote the resolution of cases. The penalty may be reduced or waived at the discretion of the Director upon good faith efforts toward compliance. 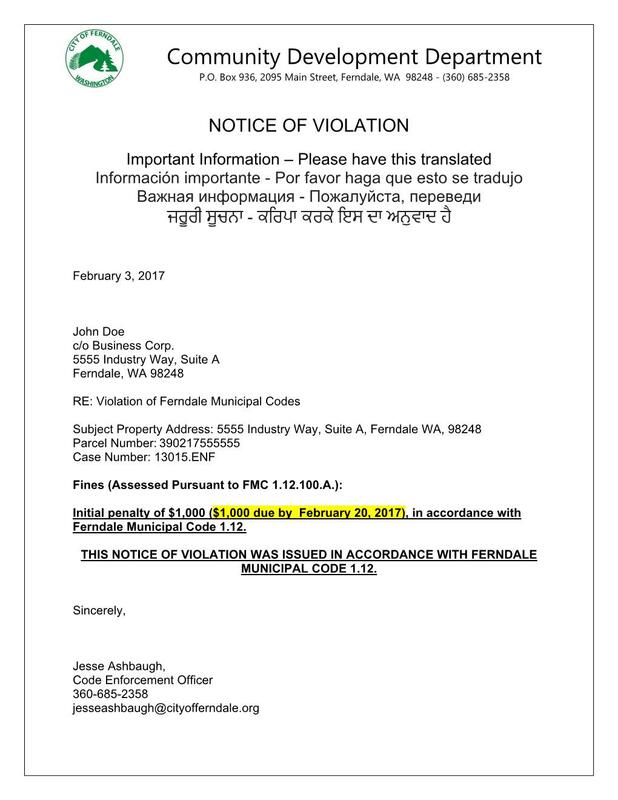 See Ferndale Municipal Code 1.12.040 and 1.12.100 for more details. 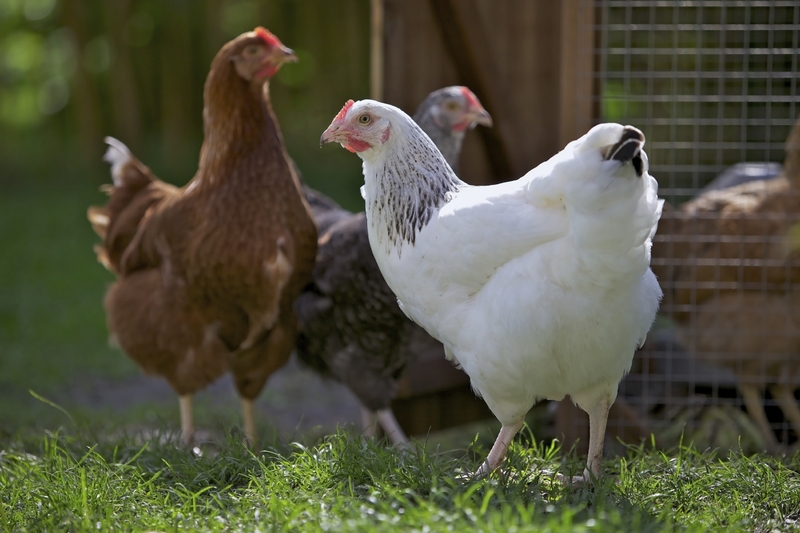 Can a code violation be appealed? Yes. The party of record or responsible party must submit an appeal to the Community Development Director within 10 calendar days of service of a Notice of Violation. For more information on appeals see Ferndale Municipal Code 1.12.080. What do I do if I receive a “Notice of Violation” or “Stop Work Order”? The first thing to do is to read the letter carefully. The document contains specific information about why you have received the letter, what needs to be done to resolve the violation and how to proceed. After thoroughly reading the letter, you may contact City staff with any questions. The staff member in charge of your case and their contact information should be clearly stated at the bottom of the page. Most violations can easily be resolved when responsible parties work with City staff toward compliance with applicable City code provisions. Click here for more information on common code enforcement questions. 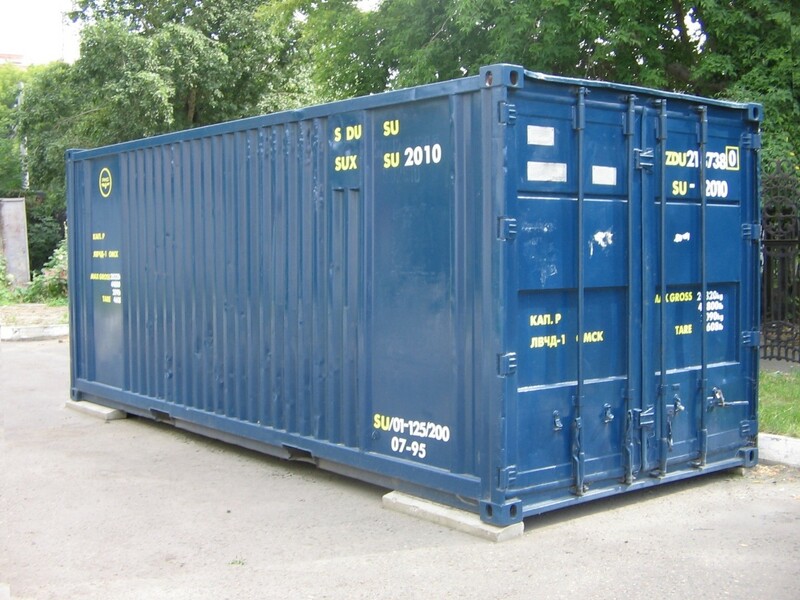 Thinking about placing a shipping container on your residential property? Containers must be placed in a designated driveway – not in the grass. If you’re considering getting a container, please contact City Hall so we can answer all your questions. Check out the Common Code Violations in the box next to this one or give Code Enforcement Officer Jesse Ashbaugh a call at (360) 685-2358 or email him at jesseashbaugh@cityofferndale.org.